This review first appeared in the April 9, 1993 issue of the North County Blade-Citizen (now North County Times). 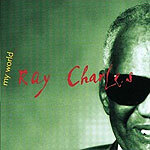 It's being reported that this album represents Ray Charles' latest attempt to break back into the Top 40 charts again. Which would explain the contemporary hip hop drum machine and overblown arrangements that mar several of the songs here. Charles may have conquered styles from jazz and R&B to rock and country-western, but on '90s-flavored dance music he sounds lost. On the title track, "Let Me Take Over," it sounds as if he's singing over top a Janet Jackson song  he never clicks with the rapid rhythms, and sounds as if he's always a step behind. The fact that he's not playing piano or organ here might contribute to the disjointed results  Charles has always played and sung at the same time, melding voice and hands into a single instrument. Having Billy Preston sit in on organ while Charles sits on his hands and sings makes no sense. A few tracks offer glimpses of Charles' magic. On Leon Russell's "A Song for You," Paul Simon's "Still Crazy After All These Years" and "If I Could," Charles shows he remains in the first rank as a vocal interpreter of 20th century popular songs. Still, they aren't enough to make this album the success he and his fans deserve.